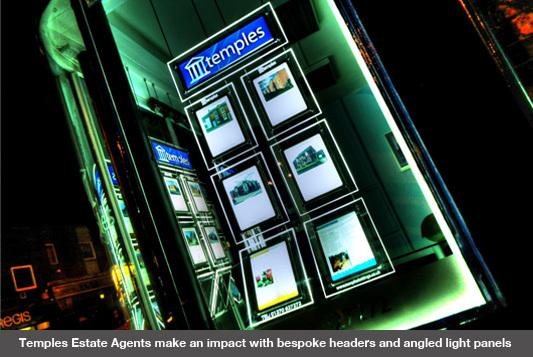 Not Invested In Light Panels Yet In this economical climate you might think that investing in new window displays is a financial risk, however now is the time to ensure that your business stands out from your competitors. After all, He who shouts loudest gets heard! 1. Light Panels are powered using energy efficient LED bulbs. These use less electricity and will significantly reduce your utility bills when compared to traditional filament bulbs. In fact an A4 Light Panel uses 3.6 Watts and an A3 Light Panel uses 5.4 Watts. 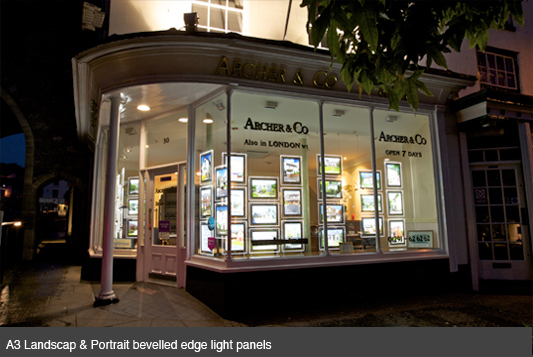 Light Panels are so bright your window display will not require any further lighting. 2. Due to their low power consumption they can be left switched on for 24 hours a day ensuring your business looks open all day everyday, even on the darkest of British days. Light Panels will attract the attention of even the most unobservant house hunter. 3. LED bulbs have a life expectancy of around 7-10 years making them a lifetime product, therefore they require no maintenance. 4. The special pattern printed at the rear evenly illuminate any property detail slotted within them. For best results we recommend using backlit paper. Light Panels are available in all standard paper sizes however bespoke sizes are available on request. 5. Finally, by purchasing your Light Panels from Mid West Displays you will be supporting the British economy. All of our Light Panels are manufactured in-house at our Head Office in Shrewsbury, Shropshire. Why not come and see where the Light Panels are made and view our full Light Panel ranges You will be amazed! Stuart Archer of Archer & Co.
Steve Kitchen, Lettings Manager. Temples. To support the local and UK economy where ever possible we have used fittings and materials manufactured in the UK. The staff at Mid West have been very patient and were extremely helpful as we worked our way through the design process and provided us with items that fit exactly to our requirements. The installation process was seamless and accommodating. Stuart MacKendrick. Managing Director. MacKendrick Norcott, Winterbourne, Bristol. If you require further details or any help phone our sales team on 01743 465531 who will be happy to help you.